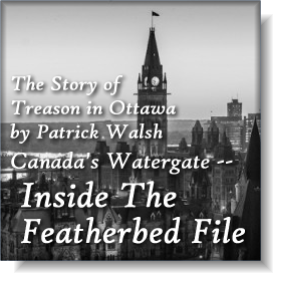 The foregoing posts are based on the 1982 pamphlet entitled Inside The Featherbed File ~ Canada’s Watergate — The Story of Treason in Ottawa by Patrick Walsh, former RCMP special operations undercover agent. As can a chunk of the FBI’s Soviet espionage file on Leaster Bowles (aka “Mike”) Pearson. A remaining question is why Pearson and the Liberal hierarchy decided to cover up for Watkins. Was it simply because Pearson and Watkins were huge personal friends? If so, this meant that Pearson’s own priorities came ahead of those of Canadians in general. Or was it because letting one skeleton out of the closet would lead to many more exposures and create shattering embarrassment for the Liberal bureaucracy? That would explain a lot of things of recent years, wouldn’t it! We read in the Scripture: “Ye shall know the truth, and the truth shall make you free.” The fog of treason and apathy is slowly lifting. The facts and reality are beginning to emerge. May this booklet make a modest contribution to a national awakening. It was his home-town publication, The Gazette, which pinpointed how secret Orders-in-Council were used by Trudeau to ensure that the new Prime Minister Joe Clark would be bamboozled into an agreement whereby the hitherto unpublished portions of the Gouzenko report as well as the subsequent Featherbed File remained sealed for at least 20 years. In a secret Order-in-Council issued in his last days as Prime Minister, Pierre Trudeau ordered all the police intelligence files on him and his Cabinet colleagues be sealed for at least 20 years, The Gazette has learned. The files were part of a top-secret investigation called “Operation Featherbed” that was started by the Royal Canadian Mounted Police in the early 1960s . . . Repeated efforts by Trudeau and other senior Liberals to gain access to the Featherbed files were turned down by the RCMP security branch. But senior members of the security service have told the Gazette that the file includes material on the private lives of influential Canadian figures, their past political affiliations, contacts with agents of foreign powers, private weaknesses or vices and even sexual practices. There was such an uproar from backbenchers in the short-lived Clark government over this “Operation Cover-Up” that pressure from the grassroots finally forced PM Joe Clark to make an amazing statement concerning the suppressed Featherbed File. The Prime Minister (Clark) said he has no intention of ever making the (Featherbed) file public. “Were we to publish that, we would be giving credence to gossip that affects people, some of whom are still in Ottawa …” he told a news conference. Clark’s blunt remarks conflict with the Royal Canadian Mounted Police and back-bench MPs in his own party who maintain the files show direct links between government officials and the Communist party. Several MPs in the last month have demanded the government review the Taschereau Papers, secret records of a Royal Commission investigation of the 1946 Igor Gouzenko spy case, and check out reports that a “fifth man” in the Anthony Blunt Soviet spy ring in Britain was Canadian. Lawrence also told the Sunday Star about the time he says he was asked not to check the Trudeau files. He said he was approached “early on in the game” (meaning Clark’s term of office) by a man who’d been appointed as custodian of Trudeau’s cabinet documents. Under a so-called “convention,” leaders of incoming governments traditionally have signed an agreement not to delve into cabinet papers of an outgoing administration. Tory leader Joe Clark signed such an agreement — drawn up by Trudeau’s office — the night before he was sworn in as prime minister. Some Tory MPs — Lawrence among them — think that was a mistake because the agreement, they allege, went much farther than any previous pact and effectively locked away many more papers than just cabinet documents. (Tory MP Tom Cossitt describes the signing as “a grave error.”) “He (the custodian) asked me specifically not to request documents relating to Trudeau’s personal life,” Lawrence said. “He said the RCMP had them, like past history associations. “They related to security questions about Trudeau himself in his younger days,” when Trudeau was a world traveller. Lawrence wouldn’t say if he did look at them. … Cossitt (the Tory MP) also says that one of Trudeau’s last acts as prime minister in 1979, before handing over office to Clark, was to sign an order-in-council preventing the McDonald commission into RCMP wrongdoing from seeing certain cabinet documents without his permission. The agreement Clark signed ensured that the order would stand. But, says Lawrence, that agreement covered far more than cabinet documents. As solicitor-general he’d tried to see documents relating to the 35-year-old Gouzenko spy case dealing with a Soviet espionage ring. Civil servants wouldn’t show them to him because of a previous order from Trudeau’s office. When Lawrence asked officials why certain “security breaches” weren’t prosecuted, he was told that was the policy of the day. The reasons for that policy were locked away in cabinet papers. I was given reports on what happened, but not on the reasons for the government decisions on why they didn’t prosecute. Canadian governments have hushed up all sorts of things. So much for the Star’s report. It confirms three decades of warnings by Canadian Intelligence publications that treason has been riding high in Ottawa; and it also confirms the fact that Joe Clark was so politically immature that Old Machiavelli, before handing over the keys to him for a brief interlude in 1979, tricked young Joe into actually covering up the Featherbed File scandal and thus unwittingly becoming himself a party to treason. And, as Mr. Lawrence implies, it was the civil servants, still under the former PM’s ‘orders,’ who called the tune, not the ministers in the Clark Government! A few years later Gagnon was to prove that he would not make a similar mistake. When I publicly called him a Communist in 1956 and produced a photostat of a letter of his which he had once written to me, showing beyond any shadow of a doubt that he was a Communist, he refused to be goaded on to sue me for libel — although he did bluff a libel suit on a few prominent politicians who had repeated my statements. But, significantly, when the time for the trials came along Mr. Gagnon failed to show up and the suits were dismissed. He knew only too well that I could easily prove he had been, and was still, a Communist. A number of Liberals were disturbed by the references in the press to his Communist record. As the Quebec Liberal Party was trying to recoup its lost political prestige, and Gagnon was the virtual head of the Provincial Liberal publicity department, many sincere anti-Communist Liberals were convinced that he was more of a liability than an asset to the Liberal cause. Some of the more outspoken Liberals were always urging Gagnon to sue newspapers for libel whenever any reference to his Communist past or to his participation in the Gouzenko affair was mentioned. Every move against the Communists was felt by the liberals as a move against themselves. If only for the sake of their public health record, the liberals, to protect their power, must seek as long as possible to conceal from themselves and everybody else the fact that the Government had been Communist-penetrated. To get back to our conversation in the diner in 1952, Gagnon stated that he was “better protected” than even Alger Hiss, who even after conviction enjoyed the support of the Secretary of State and Supreme Court Justices! After a furtive look-around, Gagnon exultingly whispered across the dinner table, “What I have more than Alger Hiss had to protect me from exposure is the fact that I did work for British Intelligence at one time.” Obviously he thought that nobody could ever believe he had been a Communist because of the fact that he had worked for British Intelligence during the war. The mere fact that Gagnon was first recommended to the British Foreign Office by Donald Maclean (the Soviet agent in the British Foreign Office who later fled to the Soviet Union) is rather significant. And the fact that whilst in London and other cities he seemed more interested in looking up Soviet contacts than in carrying out the work he was paid for (radio programs for the BBC, British double-checking of North African ‘contacts,’ etc.) was one of the reasons the British Intelligence dropped him like a hot potato. His pro-Soviet past was even too unsavoury for the French in North Africa, and neither he nor his wife was allowed to stay in Algiers after the Allied landings. Whilst this writer was working for the RCMP Special Branch, he continually received specific instructions to supply as much information as possible on Gagnon’s underground Communist activities; and the late Superintendent, John Leopold, expressed disgust when the name of Jean-Louis Gagnon was ‘omitted’ from the final report of the Royal Commission pursuant to the Gouzenko revelations. In one of the Gouzenko documents it was plainly indicated that Jean-Louis Gagnon had supplied the ‘D-Day’ date [June 5th-6th] to Colonel Zabotin after Gagnon had received this information from the famous ‘missing papers.’. . .
At the left is a photographic reproduction of a 1943 flier, promoting a Communist Youth Convention at which the featured speakers were none other than Jean-Louis Gagnon and Fred Rose, the Communist MP and Soviet spy. Immediately below is a reproduction from an issue of the Communist organ, La Victoire, in which Jean-Louis Gagnon honours this Red publication. Two other ‘leading citizens’ who similarly ‘honoured’ this Red organ were Fred Rose and Bob Haddow, both notorious Red leaders. NOTE: Over the years, both The Canadian Intelligence Service and On Target have published many reports on this incredible Gagnon case, giving more details and documentation. Several of these articles and reports have been gathered together and are available in a “packet” for $2. Order from: Canadian Intelligence Publications, Box 130, Flesherton, Ontario NOC 1EO. When we come to the Trudeau era it is significant that the ongoing “useful tradition of collegiality” referred to previously by Prof. Granatstein, by which the top mandarins in the civil service were switched around like musical chairs, accelerated rather than diminished. This not only applied to the members of Privy Council but to the Crown corporations as well. A typical case is that of Jean-Louis Gagnon, a long-time personal friend of the Trudeau-Marchand-Pelletier triumvirate. Mr. John Gamble [York North]: Mr. Speaker, my question is for the Secretary of State and Minister of Communications. Is the Secretary of State and Minister of Communications aware that a certain Jean-Louis Gagnon, as a member of the CRTC, was observed while in Paris by the French security forces in the company of a known KGB agent who was apprehended transmitting missile secrets to the U.S.S.R.? Is he further aware that the said Jean-Louis Gagnon was a card-carrying member of the communist party and, if aware of these circumstances, does he consider it appropriate that this gentleman, occupying this sensitive position moulding communications policy, should retain his present position? Hon. David MacDonald (Secretary of State and Minister of Communications): Mr. Speaker, I should point out that it is not as Secretary of State, but as Minister of Communications that I will be responsible for questions related to Mr. Gagnon. Accusations similar to what the hon. member has said have been made before. As I understand it, there is nothing in Mr. Gagnon’s career that would make him ineligible to serve on the CRTC. Indeed, he has given outstanding service on that body. I first met Gagnon in 1935 when we were both in the Valcartier Camp Unemployed Project. Gagnon was a member of the Young Communist League at that time, and had been sent there by Professor Stanley B. Ryerson, the editor of the Communist publication Clarté in Montreal. Ryerson was then known under the name of “Comrade E. Roger.” This was the same Ryerson who later became one of the top leaders of the Communist Party in Toronto and whose wife, Edna Ryerson, is a school trustee on the Toronto School Board. Ryerson had just returned from the famed Sorbonne University in France, and Gagnon became one of his many ‘prize’ recruits. We came out of Valcartier Camp together and were prominent in organizing the Quebec City unemployed from 1935 to 1938. Quebec City newspapers of those years abound in descriptions of our meetings. Those were the days of the ‘Popular Front,’ and Gagnon succeeded in infiltrating the nationalistic separatist movement which centred around the publication La Nation (founded, incidentally, by Paul Bouchard, and not by Gagnon as Leese states in his article). Gagnon became Secretary-Treasurer of L’Union Nationale Ouvrière (UNO), an unemployed organization controlled by the Separatists in 1936-37. He was also writing in La Nation, and succeeded in creating a Communist cell of four members. And when this secret cell (code name “Politburo”) was exposed by Paul Bouchard, who accidentally found a document that one of the cell members had thoughtlessly forgotten, these four Reds and Gagnon were expelled publicly from La Nation as Communist infiltrators. All of these five were then in turn expelled from the UNO when they tried to ‘take over’ this unemployed organization. All of this is public knowledge and was published in newspapers in Quebec City at that time. Needless to say, the Gagnon group did not dare sue Bouchard for libel because he had the secret document in his possession, in which the conspiratorial activities of the Gagnon group along Communist infiltration lines was clearly outlined. During this time I was learning to speak French and was only a simple member of the UNO, but because I was identified with the Gagnon group I was also ‘expelled’ from the UNO. After the expulsion of Gagnon and the four other Reds from both La Nation and the UNO unemployed organization, we received the visit of Stanley B. Ryerson, Dave Kashtan and Emery Samuel, three top Commie ‘fonctionnaires.’ Ryerson analyzed the situation arising out of the failure to infiltrate the Separatist organization by the Quebec Communists, and it was then decided that Gagnon would infiltrate the ‘bourgeois’ press. And the next morning he was hired as a ‘reporter’ for Le Journal! In 1939 when war was declared the Communist Party was outlawed and, following a preconceived plan, all of the Communists went ‘underground.’ However, Gagnon had succeeded so well in infiltrating the ‘bourgeois’ press that he became editor-in-chief of the now merged L’Évènement-Journal and received strict Communist Party orders to “play his role and avoid internment.” Leese conveniently forgets to mention that Gagnon only advocated a pro-war policy the same day the Soviet Union was attacked by Nazi Germany—and this in accordance with the acrobatic flip in the ‘party line’ which overnight changed the slogan “imperialist war” to “war of liberation.” During all these years I was in continual contact with Gagnon, either at meetings or through written correspondence when I was a union organizer in the Abitibi district in 1938-39. I knew Gagnon as a hidebound, blinkered Stalinist, a dues-paying member of both the Communist Party and the subsequent Labour Progressive Party which replaced the outlawed C.P. after 1942. From 1935 to 1940 Gagnon had been involved in so many Red ‘fronts’ that he became a master of intrigue and duplicity. He could be a ‘respectable’ newspaper editor one day, and the next could arrange a secret meeting between Communist leader Tim Buck and gullible sympathizers of the Soviet cause from the ‘bourgeois’ Upper-Town. His many talents equipped him for such diverse tasks as trying to blow up the monument to the Boer War Veterans one night, and the next night blandly speaking about English Literature to a Kiwanis gathering. But it was during the vital war years of 1942-45 that Gagnon was to surpass himself in Red intrigue and Soviet espionage. He was much too valuable and well-trained for the Communist apparatus to leave in Quebec City. Precisely because his Commie background was unknown to the Montreal public at large (but not unknown to the Provincial Police anti-subversive squad, which conveniently had been ‘disbanded’ by the Godbout Government in 1941) he was ordered to Montreal by Fred Rose and Stanley Ryerson, and before long he had become a darling of the CBC, where the Communists were solidly entrenched during the war years. He publicly appeared at Communist meetings on the same platform as Fred Rose; and, with the help of secret Communists in Ottawa he was soon ‘attached’ to External Affairs, another Red breeding-ground in these years when hundreds of known and secret Communists were infiltrating the civil service. Also, at that time the Communists had wide influence in Washington under the protective wing of the Alger Hiss-Harry Dexter White groups. With Dr. Raymond Boyer and Frederick Vanderbilt Field as ‘sponsors,’ Gagnon was able to infiltrate again higher. “From 1962 to 1968, after a 6-year residency in Canada, Col. Rudolph Albert Herrmann, a Soviet KGB illegal resident, was instructed by Moscow to proceed to the United States. Col. Herrmann’s 25-year career with the KGB began in the 1950’s while serving in the military of a Soviet-bloc country. His initial training in espionage techniques such as secret writing and cipher systems took place in Communist East Germany. More advanced training was received in the Soviet Union. Not long after his arrival in the USA, Col. Herrmann was identified by FBI agents and then decided to co-operate with the FBI. Through Herrmann’s co-operation, the FBI has achieved significant and sustained counter-intelligence objective and is pursuing additional leads developed from Herrmann’s information. The Herrmann family has been granted asylum in the United States and has been resettled under a new identity. For several weeks the mass media splashed Professor Hambleton’s declarations on the front pages and on the TV screens. Hambleton gave an interview to the Ottawa Journal in which he boasted of his many “achievements” during the 30 years he admitted working for the Soviet KGB in Ottawa and foreign countries. Repeated attempts by federal MPs to get some kind of confirmation from the federal government failed to even get on the “Order Paper” at question time. 1. To the knowledge of the government, did Professor Hambleton of Laval University, work for the KGB in (a) Canada (b) France (c) Israel (d) Saudi Arabia (e) Spain (f) certain sections of Latin America (g) any other country? 2. To the knowledge of the government, did Professor Hambleton make the statement, that if he was charged and put on trial “a lot of big names in Ottawa are going to go down with me“? Hon. Bob Kaplan (Solicitor General): The Government of Canada believes that it would not be in the public’s interest to either confirm or deny or provide additional information on this investigation. 1. Did Professor Hambleton of Laval University admit to having contact with a known agent of a foreign power and, if so, was he charged under the Official Secrets Act and, if not, for what reason? 2. Was he receiving coded wireless instructions from Moscow, depositing messages in “dead letter” drops, etc? 3. What is a complete history of all employment directly or by contract with the government or any Crown corporation by Professor Hambleton, and did he perform certain duties in connection with the Canadian International Development Agency and, if so, what are the details of such duties? Hon. Bob Kaplan (Solicitor General): The Government of Canada believes that it would not be in the public’s interest to either confirm or deny or provide information on this investigation. “To all his questions he received from Solicitor-General Robert Kaplan the Canadian Cabinet Minister’s equivalent of the Fifth Amendment: ‘The Government of Canada believes that it would not be in the public’s interest to either confirm or deny or provide any additional information.’ Professor Hambleton has never been charged. Prime Minister Pierre Trudeau tried to stem the drain of senior civil service talent by easing up on security restrictions for homosexuals. “Trudeau saw the end of the External Affairs department with so many top people being investigated and seen at orgies, that he opted for keeping them if they accepted medical treatment,” said a former top-level RCMP officer. The RCMP investigation of the blackmailed ambassadors, helped by the CIA and FBI, delved deeply into the chain in External that had promoted suspect ambassadors, at least four, to sensitive posts. Part of that investigation was directed at Pearson, a friend of Watkins who had served as external affairs minister before becoming prime minister. The FBI had 4,000 transcript pages of testimony, interrogation and cross-references from and about Elizabeth Bentley, long-time secretary of the Communist Party of the U.S. Included in the bundle sent to Ottawa was Bentley’s secret testimony before the U.S. Senate Internal Security subcommittee. She testified that during World War II, Pearson as ambassador to Washington, had fed details of top-secret deliberations among western Allied powers to a Soviet agent, Hazen Size. Bentley said Pearson knew that Size was a Soviet agent. Size, an architect, came to Ottawa after the war and worked for the National Capital Commission until his retirement. He died in Montreal several years ago. The U.S. spooks were also unnerved by Pearson’s vigorous defence of his colleague, Herbert Norman, ambassador to Egypt who had jumped to his death in Cairo in 1957. While Pearson was denouncing in Parliament the senate committee’s “witch-hunt” in identifying Norman as a communist, U.S. President Dwight Eisenhower held a CIA dispatch from Cairo. The message told him that on the night before Norman died, he had dined with a doctor friend and, according to the doctor, Norman said he feared that a royal commission would be called into the U.S. allegations. If called to testify, Norman said he would be forced to implicate “60 or 70″ definite and possibly up to 400 Canadians and Americans in a Soviet spy network. He said he’d rather kill himself. Early this month Willard Edwards, head of the Washington bureau of the Chicago Tribune Press Service, filed a most significant story relating to the “Norman Case.” Because it was widely suppressed by Canadian press and radio, we are reproducing, in part, the release which appeared in the July 12th Tribune. “Washington, July 11 — Canadian Ambassador Herbert E. Norman leaped to his death in Cairo last April 4 because he could not face the prospect of an investigation in which he would be forced to involve a large group of American and Canadian officials. “This is the gist of a highly secret report in the files of Canadian and American intelligence agencies which has deeply disturbed the government*; of both countries. “Norman’s suicide has remained officially a mystery. Originally, the Canadian government, then led by Lester B. Pearson, secretary of state for external affairs, attacked the senate internal security subcommittee for ‘slanders’ and ‘unsupported insinuations’ regarding the ambassador’s alleged communist background which caused him such mental grief that he ended his life. “On the eve of his suicide, Norman had dinner with his personal physician and confessed to him his mental tribulations over the international storm aroused by the senate group’s disclosures. At the present time two of the key figures in the External Affairs Department are Chester Ronning and Escott Reid, Commander William Guy Carr, on page 213 of Red Fog Over America, gives the details of the pro-Communist backgrounds of these officials, both of whom were members of the Institute of Pacific Relations. Are these key figures, operating at the policy-making level of our government, two of those whom Norman would have had to identify? Would several figures prominent in the annual Lake Couchiching ‘Conference’, sponsored by the Institute of International Affairs and the CBC, have been identified? These vital questions cannot be brushed aside just because Mr. Pearson was removed from his ministerial post a few weeks ago. The others involved still hold key posts in Ottawa. The Fabian Socialists have not only produced a fertile recruiting ground for the Communists; many of them have actively collaborated with the Communists. And when they have not directly collaborated, they have provided an effective smoke-screen for the Marxist-Leninists, both helping to shield Communist activities and to mask the Communist advance. The three stars of Skelton’s team (in External Affairs —P. W.) were Hume Wrong, Lester Pearson and Norman Robertson. It was Robertson, the youngest of these, who was Skelton’s successor. Was it a coincidence that Norman Robertson was recalled from Great Britain at the time of the Suez crisis when Herbert Norman committed suicide in Cairo? It is worth noting (although Prof. Granatstein sees no ideological significance in this) that when Robertson (in the spring of 1957) was named Ambassador to Washington he was able to contact friends from his Brookings Institute days, including U.S. Supreme Court Judge Felix Frankfurter (who had recommended Alger Hiss initially) and that top Fabian Socialist journalist, Walter Lippman! Before we leave the Norman Robertson “case” it might be of interest to note that this “hopeless administrator” who entered External Affairs in 1929 at the age of 25 was given full responsibility in all League of Nations matters until the outbreak of the Ethiopian crisis and was assigned to “United Kingdom and United States commercial relations” and “general economic and financial questions” (Saturday Night, May 1981, p. 54). Was it a mere coincidence that people like Lester Pearson and Norman Robertson became acquainted with individuals in Washington who were later exposed as Soviet spies within the American administration who were being utilized by the Soviet-directed Institute of Pacific Relations (IPR) and its Canadian branch, the Canadian Institute of International Affairs (CIIA) of which both Robertson and Pearson were active members? Thus began a useful tradition of collegiality, whereby the top job (in External Affairs —P.W.) could be rotated among the top people without the bruised feelings that had attended Robertson’s appointment in 1941. From a Canadian viewpoint, we know that Fred Poland, Dr. Raymond Boyer and Herbert Norman were in the leadership of the IPR council in Canada, known as the Canadian Institute of International Affairs (CIIA). At least twenty other Communist intellectuals across Canada have been identified at one time or another with the CIIA organization in Toronto and Vancouver. The Globe & Mail (Apr. 13, 1970), in the Zena Cherry column, stated that Lester Pearson “was now the chairman of the advisory board” of the CIIA and that there were 24 Canadian branches with one in New York City (emphasis added —P. W.) with a total of 3,000 members! Louis Kon escaped from prison in Russia and finally made his way to New York and then to Montreal around 1916. He managed to be hired as a translator, and later as an engineer for the old Montreal Light, Heat & Power Company when he returned from the ill-fated Vladivostok expedition in 1919. He then took over the Soviet AMTORG trading office in Montreal and set up the Maxim Gorky clubs across Canada with the help of Bella Gauld, Annie Buller and other Communists active in the Labour College in Montreal. It was during a meeting of young students at Queen’s University in Kingston that Louis Kon was able to recruit Oscar D. Skelton and to successfully infiltrate him into the federal civil service, where Skelton later launched the External Affairs Department. In his best-seller, The Canadian Establishment, Peter C. Newman gives only a superficial thumbnail sketch of comrade Oscar Skelton: “During the next 16 years, Skelton founded and built up Canada’s External Affairs department and as MacKenzie King’s closest adviser became the most important civil servant in Ottawa.” In his Appendix I dealing with Ottawa’s Mandarins, there is only a mere mention of Skelton’s belonging to the Rideau Club and having taught at Queen’s University, and no mention of his membership in the Canadian-Soviet Friendship Society & how he also enticed MacKenzie King to join! Skelton was careful to groom only pro-Soviet civil servants in the External Affairs Department. Most of them were being briefed by the Canadian Institute of International Affairs (CIIA), the Canadian branch of the notorious pro-Soviet Institute of Pacific Relations. Many of them (including Lester B. Pearson) saw service in Washington & London where their counterparts were also members of Soviet espionage rings. * For more revealing details, read Wall Street and the Bolshevik Revolution by Dr. Antony Sutton, listed at the back of this booklet. Who Was Comrade Louis Kon? Featherbed concluded the Federal civil service was riddled by Soviet-sympathizing ‘agents of influence,’ including four deputy ministers. The AMTORG “Trade Mission” in Montreal was run by an old Bolshevik by the name of Louis Kon. In the late ’20s and ’30s, the Comintern (Communist International) sent hundreds of Red intellectuals, mostly from French-speaking countries like France, Belgium and Switzerland, to help in a massive infiltration project aimed at the civil service of Quebec and Ottawa. Because of his previous experience as a translator-interpreter for the Canadian expeditionary force in Siberia in 1919, Louis Kon had been able to set up a network of Russian language translators-interpreters from Halifax to Vancouver, mainly in the large centres but also scattered in rural areas among the left-wing elements of the Doukhobors led by Moscow agents like the Verigins. The backbone of this Russian-speaking group was the Communist Party front, the Federation of Russian Canadians (FRC). The Russian language publication, Vestnik, was the official organ of the FRC. 4. Who Was Comrade Louis Kon?